The Cypress™ gas stove is a true revolution in stove design. The design features gentle radius-edges throughout which accentuates versatile design. The number-one feature on the Cypress is the incredibly large 745 square inches of fire-viewing glass. The open, three-side glass design allows you to view the incredibly realistic log set and dancing-flames from any angle in the room. 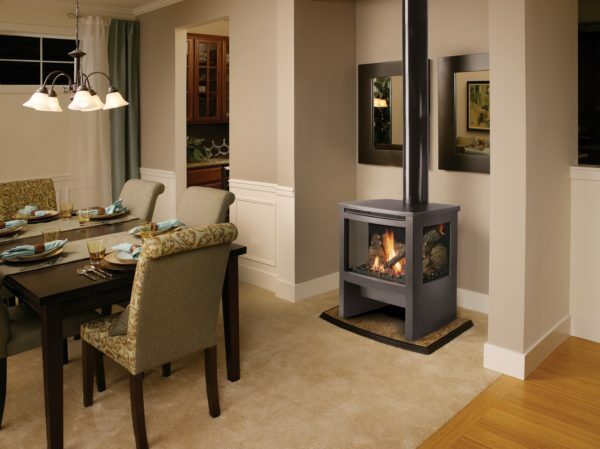 Another incredible feature on the Cypress gas stove is the downward pointing accent light. This feature beautifully highlights the logs from the top, giving the fire a radiance never before offered in a freestanding stove. The adjustable accent light can also be used when the fire is turned on low or even off to highlight the stove interior for year round enjoyment! Glass Size: 725 sq. in.